Your post really strikes a chord. I too had the same visions as you. In reality, Missy has no close friends, some of my 'friends' have disappeared, I'm too shy to talk at the school gate to a load of mums who all know each other anyway from nursery. I wish I'd spoken more to adopters whilst doing our homestudy and found out the reality. My new set of friends are you guys online and the adopter support group locally I've joined. Yes, we're really lucky that there is great online support. I must try harder to find some local support, can't beat talking to people in RL who actually understand. I can empathise with you but from the point of view of a mum of an autistic son. He is my third child and although his older brothers are not huge socialites they did play dates, had friends round and OH and I became friends with their parents. Number 3 son however is a very different child or rather has different needs and so early on I realised (having tried it for a while) that I would have to abandon the well trodden path and do things differently. He wants and needs consistency and often is happy just me and him. He has friends at school but we don't so many play dates as he finds it too stressful and I wanted those school friends to have good experiences playing with him briefly at school rather than experience his meltdowns at home. It does mean that party invites are thin on the ground and we don't do as much family socialising as we did when the others were his age. I think the thing to realise is that you know your son and your family and doing what suits you all is the most important thing. Thank you, I'd like to think that we know him well now, although some days it doesn't feel like it. I do know that we're on the cusp of something important, and it's make or break time. Perhaps in 6 months things will be different. All parents have different experiences, not just adopters, and I know that it must be isolating for parents of children with specific needs too? This captures my experience perfectly too. All my "little girl" dreams were about the mum I would become one day, and feel I was very unprepared for the reality. My beautiful adopted boy is now also diagnosed non-verbal autistic. Did you catch the My Son Isaac blog recently too? I know it has been widely shared, but struck a similar chord. Thank you both for your writing, it really helps to read of similar experiences, especially on the tougher days. Heartfelt thanks. Thanks for stopping by anonymous. I haven't heard of My Son Isaac, I'll try to look it up. I have to say I'm certainly not the mum I dreamed I would be during those years of infertility. I don't always have as much patience as I thought I would have and I'm not quite the earth mother I planned to be. I often feel guilty for not being everything I wanted to be. We are lucky to have a wide circle of friends and Katie is one of the popular children in school so is always being invited to parties etc. She loves being at the center of all the action. We are lucky also that she doesn't have an attachment disorder or any major issues as an adopted child at the current time. She does have her issues though and I think simply being an adoptive parent means that I am different. It's so hard telling other mums that we are going to be parents again. They automatically look at my belly and I have to explain how I become a parent. It's not just my story, it's also Katie's and, with a birth child you don't have to be so aware of how you present information. You're right. There is heaps that we're not prepared for. Some of it could be covered in preparation courses, but of course they can't cover everything, and we all react differently. I hope Katie continues to thrive amongst her friends, it's heartbreaking to see your child as 'the lonely one'. hi first time to comment here but this thread really hit a chord with me. Early days as my girls only arrived with us last september. Dont know if it just the early days or it is the way it will be but my expectations are already very different. The mother I thought I would be is nothing like the one I am being at the moment. My eldest does seem to be making friends but no sign of any meeting friends out of school yet - she is only four but compared to my niece who has loads and is the same age, I worry she is missing out. I lack patience much more then I ever thought I would. Both girls have lots of energy and are very confident and stubborn and was told they need firm boundaries. But being firm can feel not very nice. I worried I would spoil them too much (and I do spoil them) but just not like I thought I would at all. No way ready for any coffee type meetings and only have very few people to the house that I really know - not at all what I had in mind. In fact dreading my youngest next birthday and what to do. Hi there, thanks for commenting, as I said to Sarah (above) it's reassuring to know others are in similar positions. 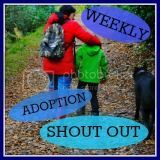 There is a great online community if you don't feel up to facing people in real life - twitter, blogs (check back here tomorrow for the Weekly Adoption Shout-Out) and various forums and message boards. Are you able to recommend any good forums? for online support? Most adopters that I know use the Adoption UK message boards. It's free, and you don't have to be a member of Adoption UK. Do remember though that these forums (and blogs) are often negative as it's where people share their problems. Not many people share their good days, they just enjoy them! Hi - I am new to adoption mummydom and it is different to what you dream of - Ive just started branching out to do new things in groups with my daughter - toddler groups etc - it is hard for her to join in and consequently hard work for me during the weeks she takes to adjust to it being new - mums ask if I have just moved in to the area - or glare when they see her run around hitting out in a new situation. Hello and welcome to mummydom! It's hard, but you sound like you're doing better than I ever did with Mini (we never made it to toddler groups etc).